NO ONE DELIVERS TRAINING QUITE LIKE ANDY! In a nutshell, possibly the best bit of training I have had in the Job. The Trainer was fantastic, with no nonsense or waffle & straight to the point.. Giving you that extra one degree of difference! 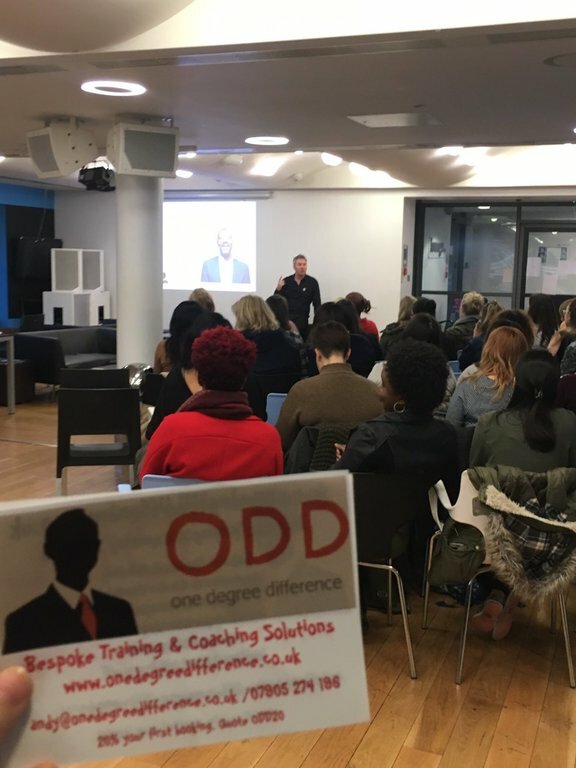 One Degree Difference is a Birmingham based training company offering effective and customisable training courses in Management, coaching, employability, performance improvement, leadership skills, and change management - with everything in between and more. We are based in Birmingham, but we cater to the whole of the UK, offering both private in-house training at your offices, or open courses. Give Andy a call today on 07905274196 or email at andy@onedegreedifference.co.uk for training in the west midlands and the UK! Is your CV not getting the attention it deserves? Do interviews fill you with fear? Do you dread answering questions about your Strengths and Weaknesses? If you’ve answered yes to any of these questions, then this practical and engaging UK training course is for you! Get training in hundreds of coaching techniques designed to help clients achieve sustainable job outcomes. Delivering training in Birmingham and UK-wide! One Degree Difference is a Birmingham based training provider that can deliver training courses within your own office, wherever you are based. "Looking at business in the same aspect as football & really worked for me"
If you are looking to improve the performance of your team then Andy is your man. He has an ability to connect and captivate audiences at all levels throughout an organisation enabling them to bring out the best in themselves and each other. His highly engaging approach is underpinned by an excellent technical knowledge and a real understanding of how to enable learning and development that delivers lasting results. We create tailored programmes to meet your requirements, with the ability to deliver training courses in Birmingham or UK wide. We don’t take products off the shelf - we create tailored programmes that meet your specific training requirements. We don’t deliver qualifications... but we can put you in touch with great organisations that do! We don’t pretend to be something we are not - we are proud of who we are and the results we achieve. I don’t suppose your ambition was to be a bad manager? Did you want to be a professional sports person, a famous singer, a train driver or a powerful business guru like Alan Sugar, Karren Brady or even Gordon Ramsay? Odds on when you pictured yourself in your dream role – you were doing an amazing job and you were mega successful, course you were… no one ever dreamt of being average or mediocre or rubbish. Yet how many managers reading this are feeling average or mediocre or rubbish right now? I’ve been working with a lot of stressed-out managers recently – I can sympathise, I’ve been a stressed-out manager myself! These managers have been beating themselves up, questioning their decision-making and regretting how they’d interacted with members of their team. However they’d got to be a manager, they all wanted to be good at their job and respected by their staff but that’s not what they were currently experiencing and that was affecting how they viewed themselves. That’s why some of them had engaged with me. When I started my business, I had some great advice, lots of people were generous with their time and insights on how to be successful. I also had some advice that I chose to ignore. I had, what I call, “Super Coaches” telling me I should focus on being an expert in one specific industry – well that would have put me out of business within months. They also told me to focus on Leadership because that was where the big money was, well I didn’t want to do that either. I wanted to help managers be more effective because I knew from painful experience how difficult a role it can be. I’ve seen some amazing and transformational leadership training delivered, I’ve also worked with a number of organisations who’ve spent tens of thousands of pounds on Leadership but don’t know how to communicate mission statements, set effective goals, have challenging conversations or manage change without upsetting the whole business. Funnily enough these Super Coaches offered to help me develop my business, but at a massive cost; they’d have happily put me out of business with what they planned to charge me, I chose to ignore them too. It’s all so clear… we can see the madness perfectly from here. Having stepped away from a corporate job to start my own business, I’ve had chance to reflect on my own management career. I think most of the time I did a good job, I made a few mistakes, but I made sure I learned from those mistakes. I took responsibility for being better and spent lots of time and energy developing my knowledge and skills in order to help others avoid the mistakes I made. And now it’s easy for me to coach or train managers; because I’m not dealing with the pressures and stresses they are - but I think that’s the key point. When you are stuck in the middle of a stressful situation: maybe your bosses are pressuring you to perform and your staff aren’t performing as you’d wish – then it’s easy to lose sight and to make bad decisions you end up regretting. With a little time and distance, you can see what you could and should have done differently; maybe you were lacking knowledge or skills, maybe the need to achieve outcomes in limited time with limited resources affected your behaviour and judgment. Maybe you still feel scarred or you’ve forgotten how stressed you felt at the time. Maybe it’s time to move past what happened? That’s why continuous development and coaching is so important for managers. Whether you are looking to upskill or if you are stuck in your current situation and need an external perspective – I’d like to think I can help. Save Us from Another New Year New Me Post… Or how my broken knee changed my life! New Years resolutions don’t work – that’s what the evidence suggests. It’s certainly true if the gym I use is anything to go by; so full of new people in January who have signed up to expensive yearlong memberships that it’s difficult to get on the car-park let alone the machines. Some of them will stick it out but most will have lost the will to carry on come February. This isn’t a post about why people sign up to gyms in January, though it does focus on committing to a fitness regime. It’s really about having a reason to change, about having something to work towards and about resilience and sticking at “it” when things get tough. I’m sat writing this post with heavy weights hanging from my knee, which looks as strange as it sounds. Almost 12 months ago to the day I fractured my tibia and ruptured almost every muscle and ligament surrounding my left knee playing “old-man football”. It was horrible and very painful. I walked with a pronounced limp for a couple of months. Luckily, I avoided having to go into plaster, the thought terrified me especially as I work for myself, it would have meant in all probability losing my business. But not going into plaster was the only bit of luck. My knee was shot to bits, it was swollen to twice its normal size, my leg couldn’t straighten and it caused havoc with my back. It was during a coaching session with a manager who needed help deciding whether to stay or leave her job when it struck me that I needed to follow my own advice. We were talking about Goal Setting and Coaching models, in particular ILED: Ideal – Locate – Explore – Do. The manager asked how I use ILED and I started talking about how I’d use it as a method to get over my injury. It had been just over a month since the injury and although I was still limping I decided to go back to the gym. My Ideal goal was to be strong enough to play 60 minutes of football before my birthday on the 10th September, a little over 6 months away. I needed to find out exactly how bad the injury was (Locate), an MRI revealed a displaced stress fracture and the resulting damage to the surrounding muscles. This information allowed me to Explore exactly whet I needed to do to achieve my goal. All that was left was the Do part. It hasn’t been easy – there’s been lots of tough times when I thought I’d never walk without limping, let alone run after a ball for an hour. I was lucky enough to find a Personal Trainer at the Gym who specialised in sports injuries, every couple of days we go through a set of stretches and strengthening training exercises that wouldn’t look out of place in a book of Medieval tortures. I also spend hours doing low impact CV workouts (something my old friend Jo would no doubt tease me about). I achieved my goal, I played my first game in late August and each week I get fitter and stronger though my leg still won’t straighten completely hence why I’m sat with weights hanging from my knee (recommended by a proper physiotherapist). If you are looking to set a goal or if you need to get your New Years resolution back on track, then I recommend ILED. I’ve used it with University Graduates anxious about exams and with people looking to lose weight or find a new job. Managers love ILED’s simplicity especially when it comes to Appraisals or challenging conversations about performance. But, like any model it only works if you commit and stick to the DO part. Of course, to commit to action and to make a lasting change your reason has to be strong enough in order to ensure you’ll stick at it! If you’d like to find out more about ILED or how I can help you achieve your goals, then get in touch. Listening is an underrated yet critical skill. Sadly, I haven’t seen “Listening” covered in too many Management programmes and I’m not sure it gets the attention it requires on Coaching courses either. You may argue that Mindfulness and The Fish Philosophy have “being in the moment” covered and that concept goes far beyond merely listening anyway but I’d suggest that not everyone is a natural listener so it’s a skill that needs to be taught and practiced continually. Rarely will listening feature as a key skill when I ask aspiring managers to list the attributes of a great manager, yet the best managers always take the time to really listen to their staff and customers. How can you obtain leadership without listening? Conversely when I ask what makes for a bad manager or leadership figure, the attitudes and behaviours associated with not listening (or being present) always come high up the list. So, if this is true for most people, then why aren’t we spending more time learning how to really listen? I was fascinated by the historical Casanova who, although famous as the foremost seduction expert of his time, was also involved in setting up the first state lottery, wrote extensively about the places he visited and the food he ate. He squandered several fortunes but in the process always managed to turn the situation to his advantage, he eventually ended up as a Librarian in Bohemian castle where he wrote his life story. We only know so much about 18th century Europe because of Casanova’s life story. But what really interested me was Casanova's ability to listen, really listen to people and the opportunities they presented. Russell T. Davies wrote this about Casanova… "When I sat down to read Casanova's autobiography, I discovered that our modern-day impression of a lascivious, misogynist man is hopelessly wrong. He's been filtered down through the centuries as a monster. I wanted to rescue him, to show what he was really like. This man genuinely loved women, and respected them with an astonishingly modern mentality. And never mind the serial philanderer - I also discovered that, outside his love life, Casanova was a wonderful, barmy, inventive man. And what a fraud! Like an 18th century Jeffrey Archer, but funny. He wasn't born an aristocrat, he lied his way into jobs and positions of power with charm and cheek and made himself a success each time. He's just irresistible." I concentrated on 3 key scenes from the miniseries the first 2 focus on Casanova’s ability to respond to the needs of the moment and his dedication to the pursuit of happiness and success. The last scene though explains how a young Casanova learned to listen. After an unsuccessful attempt to woo the youngest daughter of a notable Count, he ends up spending the time with her twin sisters instead. She explains that listening is the real route to understanding people, that listening is a seductive superpower. The older Casanova then goes on to prove the point by telling a young maid her life story even though she had no idea she’d given so much of it away. Back in training I’d demonstrate the same skills by telling each delegate all manner of things they’d revealed about themselves and then challenge them to prove that they too could be great listeners by remembering all manner of seemingly trivial yet important parts about the course. When I next met them outside of the training room I’d get them to tell me about 3 occasions where their new-found ability to really listen had been useful; the results were astounding, they’d been able to challenge with conviction and authority, they’d been able to show compassion when it was most required, they’d delivered outcomes that otherwise would have remained hidden, they’d been able to connect with customers by really understanding their requirements. mankind. It resonates as much now as it did then and is a message that it’s never too late to change our ways. business; charity, mercy and benevolence were all my business!” is the spectre’s reply. secondary theme about how organisations treat their people. The Ghost of Christmas Past introduces us to Mr Fezziwig; Scrooge remembers that his old boss had the power to render his workforce happy or unhappy; to make service light or burdensome; a pleasure or a toil. I often use Fezziwig as an example when talking about leadership skills to new managers or in coaching sessions. He also provides a template for creating a high performing and loyal team, balancing hard work with kindness and reward. advantage, and I think managers with the right leadership skills always do. behaviour for the better, hopefully we won't need the help of Marley and his 3 Ghosts to help us make that decision. Welcome to the ODD Spring Latest News & Offers section - the clocks have gone forward, gardens will have been mowed for the first time this year and if like me you have to fill out a Self Assessment form - you'll know what your tax liability is for the financial year that's just ended. It was a fantastic end to the 2018/19 period. I said goodbye to Entrust and all my Leadership & Managemant learners but immediately started delivery for The TESS Group. The TESS Group deliver a wide range of Apprenticeships, bespoke and ESF type training interventions. I'm working with management teams from Career Builder (in that there London), HTC, Abacus Recruitment & Pratts. A big thank you to Jenna Thorson, an old friend from PPDG days, for introducing me to the guys at TESS. I had a request from Sam Saunders, who is now a top manager at Shaw Trust, to design and deliver tailored Employability training for participants on the Health & Work programme. I've just completed two pilot courses at Walsall and Wolverhampton and we've already seen our first positive job outcomes. It's certainly a change from delivering leadership & management but just as interesting and definitely as challenging! A big shout out to Lesley and Jack at Birmingham City University for booking me to deliver 3 sessions for Grad + week. Over a hundred students turned out to learn about Communication, Procrastination and Goal Setting. I'd also like to thank Lesley for introducing me to Harry Allen who looks after Post Grad students. Harry has commissioned me to create a programme focusing on achieving challenging goals, students will be staying overnight at an Entrust centre in rural Staffordshire where they'll work with me before facing activities like High Ropes and Caving! There's a couple of really interesting opportunities coming up that I can't wait to share with the world - if everything comes off, I'll be a very busy boy indeed. The one thing I won't be doing though is sharing a badly shot video of my big old face, either sat in my living room or marching to or from a venue. It's the latest craze, especially on LinkedIn, personally I think the majority of these videos are dreadful and the first thing they prompt me to do is find the mute option. What do you think - let me know? Last thing - I've had a few chancers use my contact form to try and sell me their services. Really I don't need a new website, this website is splendid (thanks Arturo) and I don't need to spend loads of money on business leads. If you are thinking of using my contact form to spam me... DON'T!!! I'm running a quick offer till the end of April on any course from management, coaching, leadership skills, and everything in between: 25% off the cost of any training session for new customers. Just quote ODD25 when you contact me. All persons and organisations quoted in this section have given permission to be mentioned. If you're looking for employee or leadership training courses from a great, Birmingham based training provider (that can deliver anywhere in the UK!) Andy is your man. We provide training sessions on a number of subjects to provide effective office training in Birmingham and the UK, to help your team become more effective. Andy provides new management, performance improvement, and leadership skills training courses for your team, along with sessions for individual needs such as sessions for aspiring managers and training in coaching. Contact Andy today for a quote on 07905274196 or at andy@onedegreedifference.co.uk.